Jamie joined the staff of Creative Therapeutics in 2007. She received her master’s degree in physical therapy for the University of Evansville in 2002. In 2013, Jamie completed her board certification for Women’s Health Physical Therapy through the American Physical Therapy Association. 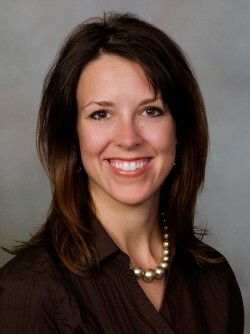 She specializes in the treatment of women and men with pelvic floor dysfunction. This includes a variety of diagnoses, such as urinary incontinence, bowel dysfunction, and chronic pelvic pain. Jamie also has a broad base of orthopedic experience and enjoys treating women throughout pregnancy and postpartum. Jamie is a member of the Section on Women’s Health and the Chicagoland Pelvic Floor Research Consortium. She is a guest lecturer at Northern Illinois University’s Doctorate of Physical Therapy Program, as well as clinical instructor. Jamie helped create the Body after Baby© program here at Creative Therapeutics, and is passionate about helping new mothers physically recover and return to their previous level of fitness after childbirth. Outside of her time at Creative, Jamie and her husband Mike manage the Justice League, keeping a household with three school-aged children, a dog and a lizard in running order.